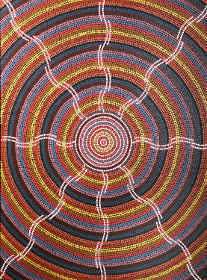 The desert Dot Art painted by Bevan Tjampitjinpa reflects a deep knowledge of the traditions of the Anmatjere people and their traditional ceremonies and laws of the desert region of Central Australia. Run your mouse over the paintings to see the incredible detail in these paintings. 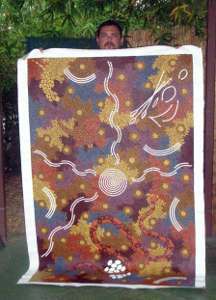 To Bevan and his people these paintings are much more than just visual images, they are maps, stories and laws of a life and culture which has been passed down since the dreamtime. Here Bevan holds one of his works for display. Bevan can often be found at the Mindil Beach Markets on a Thursday evening and is always happy to have a chat about his traditional home and art. Alternatively contact Bevan directly from here. 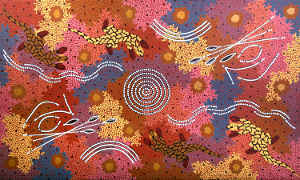 This painting depicts perenties trying to eat carpet snakes eggs in spinifix country. This water hole is located in Central Australia, north of Alice Springs (120 km) in the Anmatjere Homelands. 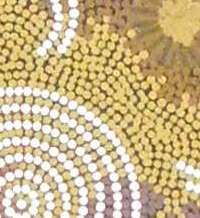 It is very important (sacred) to my people and has been used for thousands of years. Two men with spears and boomerangs hunting perenties (goannas) in spinifix and hill country (Anmatjere Homelands, Central Australia) next to big waterhole. 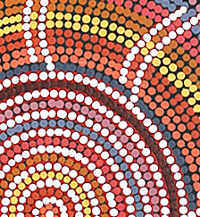 Return from Desert Dot Art to Enjoy Darwin Home.